Even if you are not interested in video and computer games you might have heard about Double Fine Adventure, a game that raised more than $3 million on Kickstarter this February – an amount of money unheard of in crowd funding until the Pebble watch came along. One of the artists working on the artwork for the new game is Scott Campbell. 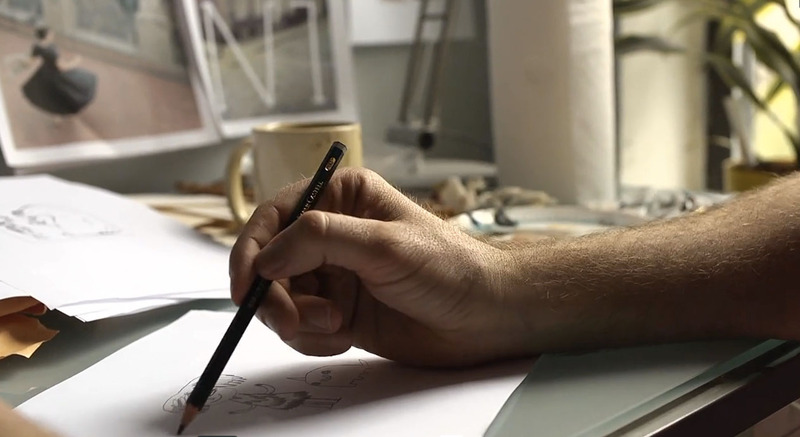 In the Double Fine Adventure documentary by 2 Player Productions he can be seen using a Faber-Castell Castell 9000 for his sketches. The images in this blog post have been taken from Episode 4: “Walking Around in Our Drawings” of the Double Fine Adventure documentary by 2 Player Productions. I believe that the use of the images shown in this blog post falls under “fair dealing” as described by the UK Copyright service. Scott Campbell, a man of discerning taste. Al ot of pencil users give FC 9000s a wide berth because they are so used to using “soft/dark” HB’s of a lesser quality. Their pencil vocabulary doesn’t seem to extend to softer grades and this is where the 9000s come into their own. 4,6, and even 8B are terriffic sketching pencils and keep a point for a surprisingly long time, rarely does the point break, unlike Derwent Graphic’s which can barely be sharpened without breakage at this level of softness…that’s my sad experience anyway. All Faber-Castell pencils seem to be a grade harder and lighter than the same number in other European pencils which is why I use B or 2B for writing. The difference is even more marked when compared to Japanese leads like Mono 100s or Hi-Unis. I don’t have any trouble with Graphics but I always knife sharpen my sketching pencils. I only use a sharpener for writing pencils and there I don’t go beyond 4B traditions which are great for crossword puzzles. I think my favourite European sketching and drawing pencils would be Lumographs, though. Kevin, I’ve got to say that I haven’t really used the very soft Castell 9000 pencils yet as I normally use them for writing, so 2B is the softest I tend to use, but I will certainly try the soft ones out. Thanks for your explanation. Michael, do you use a knife because you want to create a special shape for sketching? I really like the 9000 – I didn’t know Scott Campbell used them, despite being a fan of his too! Of the pencils I’ve tried, I find the 9000 blends slightly more easily than the Lumograph (although the Lumograph seems to give a darker line, which would tie in with Michael’s observation that the 9000 is a grade harder). Good fun if you’re a film fan! I saw your blog post about the 9000 and the Lumograph and thought that for me as someone who uses the pencil for writing, not drawing, the Lumograph is the better choice as it doesn’t smudge as easily – not saying that that’s a problem with the 9000, it’s not a smudgy pencil and I also use the 9000 regularly. Thanks for the link to The Great Showdowns. I didn’t know this series before.